In the 2.5 years that we have opened our house up on Airbnb, we have had the opportunity to meet a wide range of interesting people that we would never have the chance of meeting in everyday life. From actors to heart surgeons and engineers to spiritualists and people as far away from London as South Africa, New Zealand, California, Japan and the Philippines. Sometimes Airbnb gives us the opportunity it experience something new, both for good and for bad and back in November we had one of those opportunities when we were contacted by a class of film and media students at the local university who wanted to use our house for filming a 5 minute short movie. Quiet on the set, lights, camera and. action! My wife and I both jumped at the opportunity and when the team did a preliminary scout to our home, our immediate fears that our home might be trashed were pretty much evaporated. It would give us the chance to see film-making at work and also we would be able to see our home on the big-screen, well on our big-screen TV but hopefully later in the year at a film festival as well. The story that the film crew had decided to work on was the famous story by David McKee entitled ‘Not Now Bernard’. Pretty much anyone who grew up in the UK will be have grown up with one of his TV shows whether it be King Rolo, or my favourite Mr Benn (as if my magic, a shopkeeper appeared) or latterly filming the Spot the dog childrens show. As an side my old neighbour used to be the spitting image of Mr Benn. On the left, unassuming hero to children, Mr Benn who was an ordinary man in an ordinary house. On the right our old neighbour, Mark Prisk MP. An ordinary and rather unfriendly fellow so my friends on our street thought 20 years ago and with darker hair looked just like Mr Benn. Just imagine if he were wearing a bowler hat! He is currently a Conservative Minister. I encountered him again a few years ago and nothing had changed.. 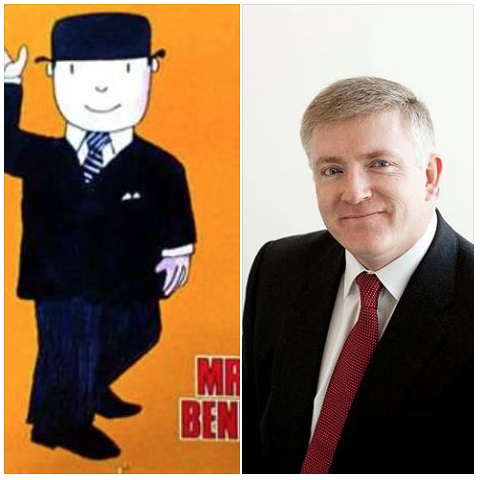 I could make up a joke here but lets just say I much preferred Mr Benn! Anyway, back to Not Now Bernard. It briefly comprises a tale of a young boy who knows that there is a monster nearby and yet no matter how much he begs his parents to listen to him, they are simply too busy or just too lazy to indulge their little boy and so Bernard goes to investigate for himself with incredible results and yet despite everything that goes on, his parents don’t notice a thing. Just part of the baggage that moved around the house to clear the way for the actual filming. 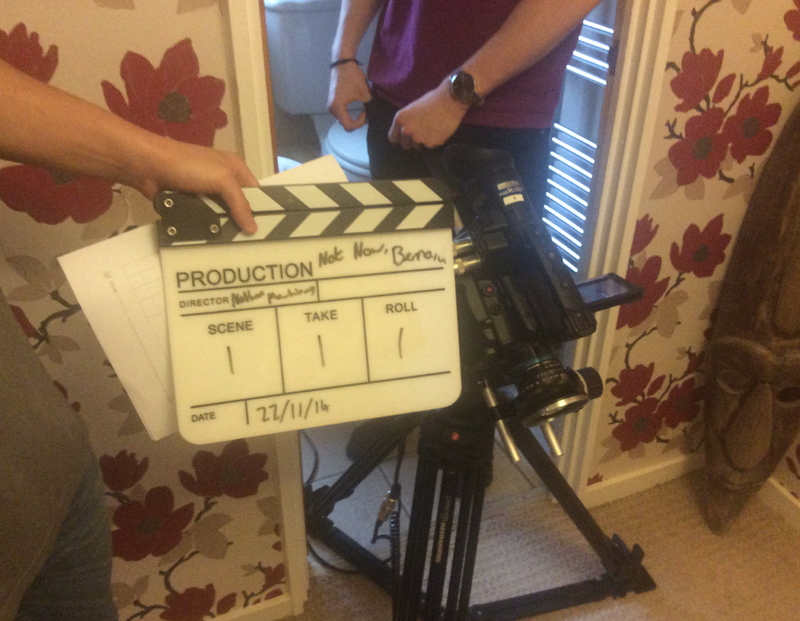 The filming took place over one weekend, by bad luck by far the wettest weekend of the winter and after months of fine weather too. So it made things more difficult for everyone . 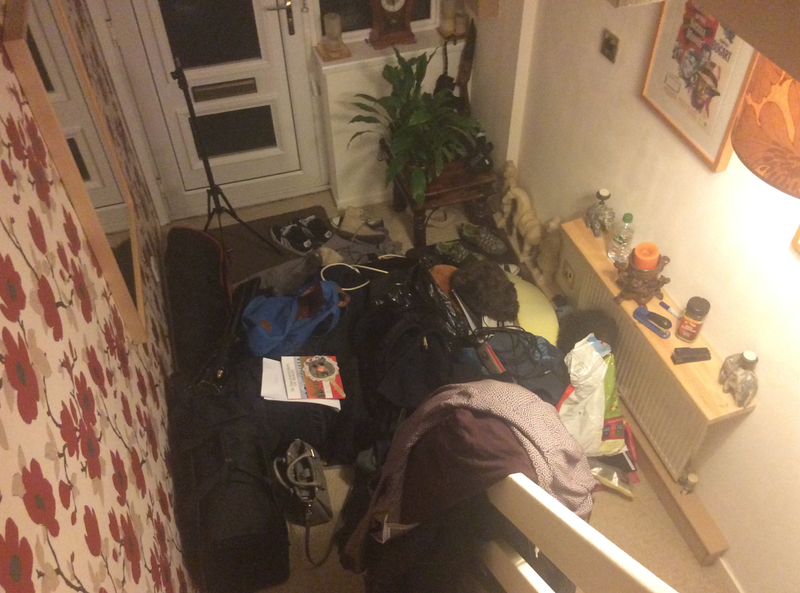 The amount of equipment and baggage that was required for the filming had to be seen to be believed and of course all of this had to be moved around the house as the story of Bernard does not include camera tripods, microphones and 20 pairs of shoes, coats and lunches. The students approached the entire project just like a movie with designated personnel assigned to everything from script writing to hospitality for the actors, lighting, cameras, direction, production and special effects! It was a very fascinating weekend although both of us left the house for several hours a day to give the team the opportunity to do what they want without us hovering in the background and also for us to get a bit of fresh air. 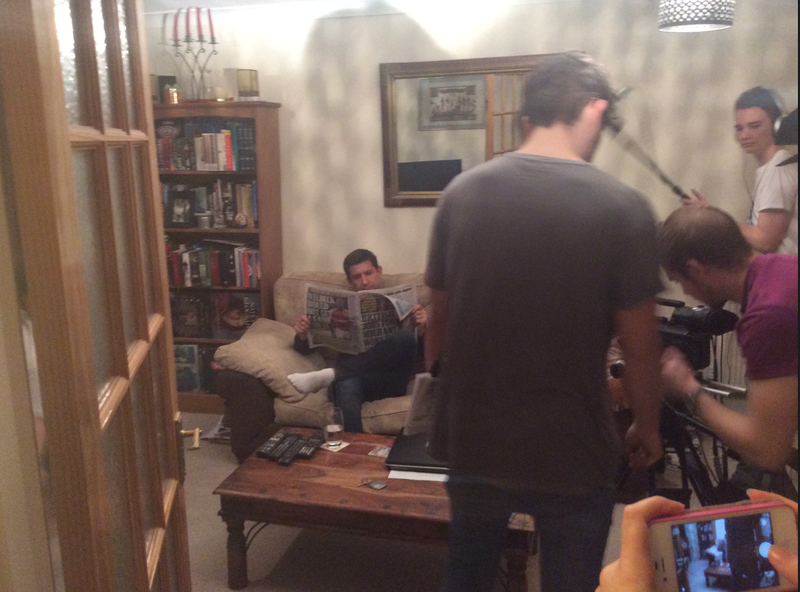 Despite various unforeseen difficulties, the shoot went if anything, ahead of schedule and we eagerly waited a month or so until the film could be all put together. Last week the wait was over and we received an email with a link to the completed movie. I’m sure you’ll agree that everyone involved did a tremendous job and for us we gained an insight into movie making and another unique Airbnb experience as well as a unique momento of our home when we eventually move somewhere else. It’s a wrap! 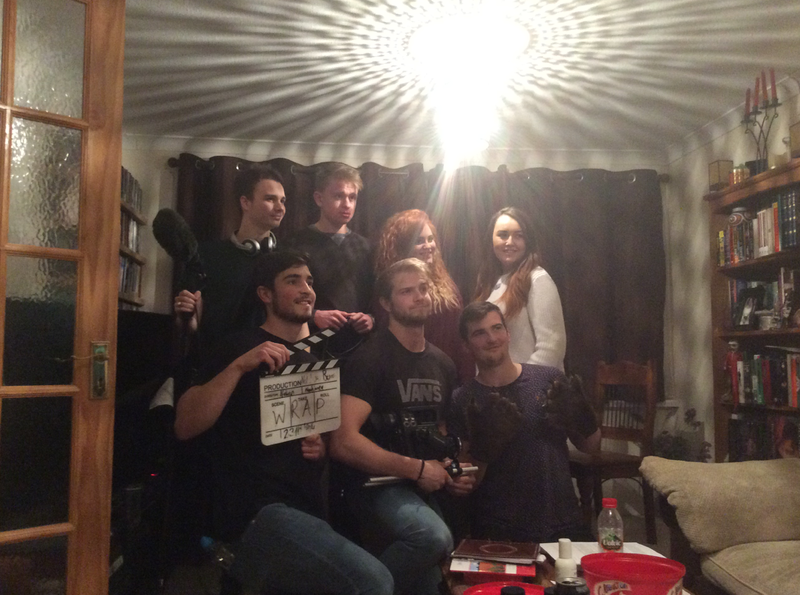 The behind the scenes crew of Not Now Bernard! Considering that there was no budget so to speak and the constraints they had to work under I think they did a fantastic job, right down to the music and credits. I believe the actors volunteered their time but they did great performances and came over very natural. I can imagine on BBC1 or Channel 4 on Christmas morning just after The Gruffalo or The Snowman. So without further ado, I hereby present Not Now Bernard. You can just about make out towards the end of the film that the Dad is reading my ‘In The Footsteps of Heroes’ book… nice choice if I do say so myself. This entry was posted in Life, Movies and Films, Popular Culture, writing and tagged Airbnb, David McKee, How To Get Rich Using Airbnb, Life, movies, Mr Benn, Not Now Bernard, television, TV. Bookmark the permalink. It is there, maybe your web software needs updating. Loved this! Delightful film and story! And loved your house too! Thank-you! The film is delightful and very cute. I’m glad you liked the house too! Great fun moral: take your kiDS seriously! Yes, there is nothing worse than parents not listening to their kids when monsters are around! I’m glad that you enjoyed it. Yes too many parents either ignore their children or do what they think the child wants or needs rather than listening to what the child is saying. Delightful. The music and the wiggling letters were a nice touch. It is amazing how much can be conveyed in 5 minutes, and in an understated way. I liked the music and wiggling letters too. It gives the whole film a really nice finishing touch! Dare, I say it? It was an adorable movie, despite the poor child’s demise. I wish the cast and crew many years of success. I’d love to see more of their work. I think they have moved from being film students to interesting storytellers. Oh, this is so cool! I saw your name in the credits, and I now I feel like I’ve been in your house. Very nice! It’s very homey. Wow, mom doesn’t even kiss her son goodnight. It’s a great little short. They did a fine job.